There is something about unclear options which make choices a lot more interesting. This post goes into the reasons behind this, and various ways of achieving it in games. Warning: this post will include some spoilers for Spec Ops: The Line. The situation is clearly set up and you are explicitly told what your options are. While they are most common in interactive movies, these sort of choices existing in just about every genre. They are easy to setup and can easily give a sense of moral drama. However, they miss out on a really important aspect of making real-life choices: that you are almost never aware what your options are or what they lead to. The player could avoid the incoming bullet by going down, or they could do it by going up. This is a choice very much in the same vein as the one from above. However there is no explicit prompt that asks the player what direction they want to go in. Instead the choice is implicitly stated through the use of the game's mechanics. And in contrast to the explicit choice, it is unclear just what the options are. The choice might lack the ethical implications from the previous one, but the choice itself is way more interesting. It also feels like an ingrained part of the play experience instead of something that is an obviously designed situation. 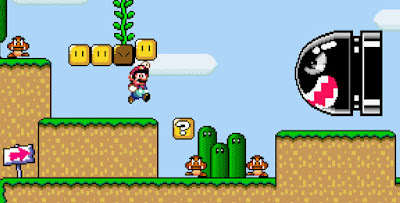 Super Mario derives this choice purely from the functioning of its basic mechanics. Simulation is another game genre that does this, but manages to add a bit more philosophical depth to the choices. For instance, in a simulation game focused on survival you might not have enough food for all your party members and have to make a decision on who lives and dies. When these things work well it can have a tremendous impact - but more often that's not the case. 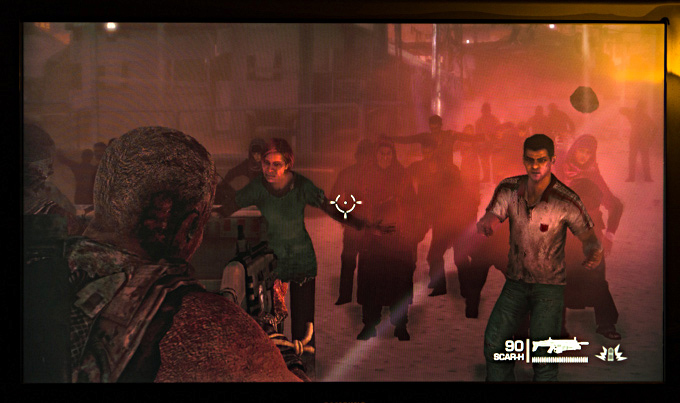 Letting your simulated party members starve to death very rarely give rise to the same strong feelings as a scene in a game like The Walking Dead. Let's unpack why this is so. In order for a choice to be made, the player need to understand that they are making one. The cornerstone of this is the player's access to affordances. The player must have a robust mental model where they understand how the various aspects of the world work, and what abilities they can use to affect it. A choice then arises when it becomes clear to the player that there are two or more separate ways in which they can progress. Basically, the player understands that are at least two distinct plans for them to make, and they need to chose one of them. When this is crystal clear, the player has a choice on their hands. Most games feature these sort of choices all the time. "What ammo should I use? ", "What path should I take? ", "Should I sneak or just attack?". As I explained in an earlier post, the selection of plans is a fundamental part of gameplay. What makes a choice carry depth is that there's something major at stake. So not only does the player need to understand that a choice is happening, but also that a major decision is happening. And in order to elicit the correct emotional response there needs to be a particular setup and framing. A game like The Walking Dead has an easy time of it setting up all of these requirements. First of all, the game is explicitly stating that a choice is happening. It is impossible to miss. Secondly, since there is so much focus on the choice, it is quite clear that it is of major importance. Finally, The Walking Dead is heavily plotted and the designers have a great deal of control over what happens before the choice. It is relatively easy for that game to make sure the player is in the right frame of mind. Things are much harder for a simulation game. Here the player takes part in choices all of the time and it's harder to work out which ones are crucial and which ones are minor. The player might miss entirely what their choice is about. For instance, take the choice where the player needs to choose whom from their group to let die. It might be that the player doesn't understand that they are running out of food, or thinks that they have some ways to survive. So at the crucial moment when the player decides who lives and who dies, they might be thinking about other things entirely. On top of that, even if the player grasps what the choice is about, it might be lacking proper build-up. The player might not be in the right mood, or have a suitable level of affection for the characters and so on. It may of course be possible to improve the simulation to take things like this into account. However, this is very likely to run up against the complexity fallacy which I wrote about last week. Chances are that these additions to complexity will not be noticeable and instead just make the game harder to design and code. Instead, there's a middle ground here. Instead of explicitly stating the choices, it is possible to set up a situation that is driven by established gameplay mechanics. Since the setup is not something that happens dynamically, it's possible to properly signpost the scenario. That way you can make sure that the player is in the right mood. But when the actual situation arrives there is no menu popping up that flags a choice moment. Instead the instruction to choose can come from the story mechanics (e.g. a character can speak), or, better, arise from how the situation is designed. The actual options are then chosen, not through an abstract menu, but through interacting using standard gameplay mechanics. The best example of this sort of design is a scene from Spec Ops: The Line. Late in the game the player finds themselves surrounded by civilians. These people are not too happy that you are here and start throwing rocks at you. It is a very dangerous situation and it is clear that you need to get out of there. At this point, the player basically only has a single verb at their disposal: "shoot". So what can you do? You really don't want to shoot civilians, but you also don't want to die. The player really has two options here. One is to shoot at the civilians, killing a few of them and making the others run away. The other option is to simply shoot in the air and scare them off, killing nobody. The thing is that, since the game doesn't tell you what your options are, shooting in the air is not obvious to a player. And that is what makes this choice so interesting and makes it feel like a real choice. Had a prompt popped asking you to choose between "fire at civilians" and "fire in the air", the situation would have been radically different and would have lost a lot of its impact. But since you select the option with a gameplay mechanic, it not only feels like a proper part of the playable narrative, it also means that you are uncertain of what your options are. 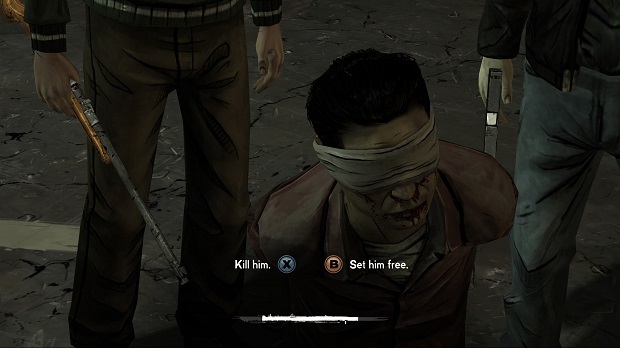 Having choices like this makes the game feel analog. Under the hood the choice is just as discrete as the ones you would make in The Walking Dead, but it doesn't feel like it. It feels like there are a spectrum of choices to be made, a continuous space of options, and not simply "this way or the other". This concept of choices feeling analog is really important and I'll talk about it more later on. Spec Ops: The Line features half a dozen or choices of this kind. For instance, there is one where you are to chose which of two prisoners lives or dies by shooting one of them. But what the game doesn't tell you is that there is a third options, which is to target the men that are holding the prisoners captive. Another scenario has you deciding whether or not to kill a war criminal. And again, it's unclear just what your options are. The game simply puts you in a situation where it is possible to kill him. That there is a choice to be made is something you have to make up your own mind about. Another interesting aspect of Spec Ops: The Line is how it handles the consequences of its choices. The solution is that it simply doesn't. It just sets up the situations in such a way that either choice makes sense for what happens later in the story. While I don't think it is possible to always shy away from showing consequences, it can be very helpful in maintaining the analog feeling. Because the moment you show a consequence, it makes it clearer that there is a discrete aspect to your choice. But if you keep consequences hidden, the possibility space is larger and the player is free to fantasize more just about what took place. It's worthwhile digging a bit deeper into this. What is it that makes the choices in Spec Ops: The Line different from a game where the options are explicitly stated? The key difference is that in the former, the player is in a position of uncertainty. There's no clear-cut information to go by and the player is forced to fill out informational gaps using their imagination. When the options are explicit there is no need for this. The brain always wants to optimize, so any concrete piece of information will remove any mental guesstimation. This leads to Spec Ops: The Line having a much more vivid mental model of the scene. Remember, we play the game based on what is in our heads - not what is in the actual systems - so that means the game itself becomes a more interesting experience. This is what the "feeling of analog" is all about. By having situations where not everything is clearly cut and where the player is free to imagine a wide range of freedoms. The goal is for it to seem like there are a continuous space of possibilities. This makes the situation feel real and organic. It lessens the feeling of there being a designer guiding your every step, despite the experience being just as guided as in the more explicit case. It's worth noting that there can be drawbacks to this approach. Just like in the pure simulation case, the player might misunderstand what the choice and its implications are all about. An explicit approach with a prompt laying out all the options will always be better at this. But it will also never feel analog. So there may very well be situations where an explicit choice is the right way to go. As always in design, one shouldn't get hung up on the manner of implementation, but to focus on what the end results are. In SOMA we tried to make all of the choices feel analog, and used a similar approach the one in Spec Ops: The Line. We presented a situation and then used common game verbs to let the player make their choice. The idea was to make the choices feel embedded in the game experience, and judging from feedback we have gotten, it feels like it worked out very well. The only choice in SOMA that didn't work properly was when you decided the fate of Wau. Here we failed create a proper emotional setup, and didn't spend enough time on implementing consequences. A lot of this was due to this choice coming quite late in design, and it feels like it shows. It is a good reminder that you can't just casually throw in these sort of choice-moments. One needs to make sure that the player is in the right mental state when they occur, and that you follow up on them in an appropriate matter. Just because something is supposed to feel analog doesn't mean it doesn't require a strict, and guided, implementation for it all to work out. It is not only moral choices that can take advantage of becoming more analog. There are a wide range of other types of gameplay where it is worth considering if it can be made more analog. A good example of this is in interactive fiction (ie, good old text adventures). Normally these are controlled by simply typing commands into a parser. The type of commands are things like "pick up lamp", "look under the carpet", "remove dust from the table", and so forth. So, normally, there is no explicit prompt saying what sort of commands are possible. You have to infer the space of possibilities by reading the descriptions you get as you explore the current environment you are in. You are building up a mental model of the place at hand, and the character you are playing as, and using that to build a sense of what is possible to you. When this all works out, it feels great. It really feels like there is a living, breathing world for you to interact with. It feels analog. This system comes with issues though and the most common one is the "guess the verb" problem. The player might know exactly what to do, but can't figure out the right commands that allow them to do it. This is really frustrating and it breaks down the sense of immersion. A way to fix this is to make it clear exactly what the various verbs at your disposal are. This solves the problem, but it adds a new one: the game loses its sense of being analog. I think it's worthwhile to give this a test yourself. First try a normal interactive fiction game. I would recommend something like Lost Pig as it allows a lot of commands and, especially in the beginning, shows just how engaging it is to play something that lets you type whatever you want at a blank prompt. After you have done so, try out Walker and Silhouette and only use the highlighted words to play. The two experiences are very different. Sure, the latter makes it a lot easier to progress and removes some frustration. But on the other hand, it removes a lot of what makes the medium interesting in the first place. I think this is a really good example of just how important the feeling of analog is. Implementation-wise, these two interactive fiction games are really similar, to the point of basically being the same. But the way that they chose to do their user interface radically changes the experience. By forcing the player to build an internal mental model of the game's world, the experience becomes so much richer. There are lots of other instances where the feeling of analog can be useful. Another good example are puzzles. I recently played through 999 which has "escape the room"-like puzzles. While these can be quite fun to play, the way they are set up it is incredibly obvious that the game wants you to reproduce a specific number of steps. You are basically trying to read the designer's mind to find a very specific chain of actions that lead to a success state. This doesn't feel very analog. A big reason this is so is because the game will only respond to very specific commands. Most of these commands are not part of a generic verb-set either. For instance, you only ever use a screwdriver in a specific place and so forth. So you never really build a mental model of how the world functions, because such a model would basically be worthless. It is much better to think of each object as a specific case of "what does the designer want me to do with this?". As such the world becomes stale and never gets a rich mental model. This is a very common problem with puzzles. However, there are puzzle games that manages to work around this. One of the best examples is Portal. In this game is rarely feels like you are following a set path. Instead it feels like you are discovering a solution. It feels analog. And this is despite the solution being no less designer-directed than your average escape-the-room game. 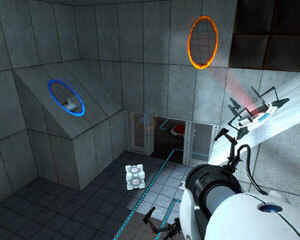 A core reason why Portal is different is that it always uses a foundational set of mechanics for solving the puzzles. You have your portal gun, the ability to pick up certain objects and to move around. That is it. Nothing else is used in order to progress. On top of that, there is a coherent design to all of this encouraging you to build a mental model around it. There might only be one specific sequence of events to solve a puzzle. But when playing Portal you are not as aware of this. Much of the time it's not even clear after you have completed a section. Because the puzzles are based on foundational verbs, it is much less clear whether there were other possible solutions available. There is often the sense that you could have completed it in another way. This consistency in actions also means that you can mentally simulate a number of possibilities. You know up front the type of interactions that are possible and can use that to work out the sort of things that you can do in order to progress. And that without needing to interact with the world at all. What this means is that you are able to make plans. You can think about what steps to take in advance and be fairly confident all of these are possible to execute. As discussed earlier, making plans is a core part of what makes gameplay engaging. This is another reason why making choices feel analog is good - it also makes it feel more like proper gameplay. The consistency in actions is not the only thing that makes Portal feel analog. The level design itself also plays a big role. By just giving the right number of hints, the player never feels pushed along a certain path, nor are they completely bewildered about what they are supposed to be doing. By not pushing the player too much, the game makes sure that the player comes up with ideas on their own. This gives a much greater sense of picking one solution out of many, instead of going along an intended route. And by making sure the solutions never feel too obscure, players refrain from trying to brute force a puzzle. Brute forcing can be quite damaging to the feeling of an analog world as this forces the player breaks down the world to its basic components, revealing the non-analog nature of it all. Getting the level of handholding right is not an easy task and how to achieve it varies a lot from game to game. The basic idea is the same, though: you want to make the player understand what to do without revealing what your preferred route is. There needs to be enough uncertainty for the player to start building a vivid mental world around a situation. But there can't be too much uncertainty as that means there is nothing to build a world on. Another example of crafting analog worlds is the closet-hiding in Amnesia. We chose to simulate this using a physics-based interaction system. We also tried to make the behavior an implicit part of the gameplay, and never directly state how it is supposed to work. Despite this, a great number of players still entered closets to hide and opened the door slightly to see if the coast was clear. We could have just had an explicit prompt and some specific controls when you are hiding behind doors, but it doesn't feel like that would have been the same kind of experience. This way, the world has a much great sense of being an analog one. There are bound to be tons of game mechanics that could make good use of becoming a bit more analog. One obvious example is dialog response, where I think there would have been a lot more to gain if the options could be chosen by using core mechanics instead from an explicit menu. The choice selection must be made by using a set of core mechanics. 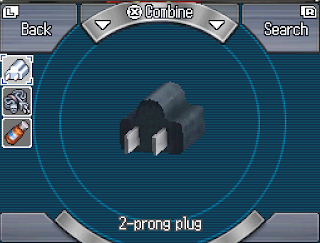 The number of ways in which these mechanics can be used must also be so large that the player can't easily grasp the options available. 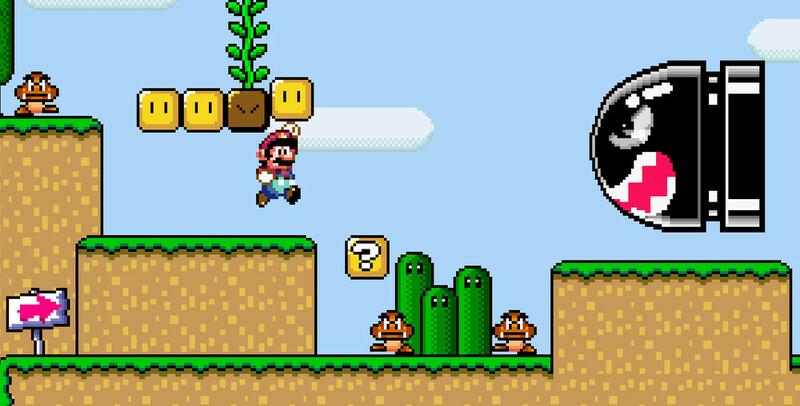 For instance, if the player can only punch red objects, and you enter a room with a single red object, the situation doesn't feel very analog. The hints on how to complete the scene can't be too direct. There needs to be a certain level of vagueness so the player feels that they have come up with the solution themselves. It's also important to teach the player (through play if possible) how the core mechanics functions. The idea is that when they encounter a choice moment (be that a puzzle, moral choice, etc.) they have an intuitive understanding of they ways they can approach it. It's also important to not just focus on the interactions at hand, but to think of it as a multi-scene setup. In order for the player to be in the right state, and to have the right mental model, there's a lot of setup required. It is really important to think holistically about these things. I think there's a lot to be gained by thinking in terms of making a world more analog. I also think that it's something that hasn't really been explored enough. It is quite common to just take something that works through explicit means and stick with it. Crafting scenes in an analog way is a lot more work, but I also think it can be really rewarding. It's also a very good concept to have in mind when trying to merge more standard narrative approach with proper gameplay. Analog worlds are a core part of evolving Interactive Storytelling. I think an important point you bring up is being in the right mental state--in Spec Ops: The Line, it may not be immediately obvious to the player that the game is complex enough to be able to scare people off by firing in the air. I think this points to a larger issue in that players are the result of their previous gaming experiences: there needs to be additional set-up if games stray too far away from the familiar. Many people build their own mental models in a way that is driven by their past experiences with games, and may unconsciously discard options that feel as if they would not be implemented in a game. The average spec ops player may not realize that the game is complex enough to allow shooting in the air. Because they know they're playing a game (and especially if they are experienced gamers), they might take an analog choice and instinctively digitize it because that's what they're used to out of their games. It's important to establish, early on, a mindset in which players do not instinctively digitize their choices. *to allow shooting in the air to be a solution. For instance, a player's mental model in a regular shooter may be that shooting at non-targets does not accomplish anything other than waste ammo. In a stealth game, their mental model may be that shooting at a non-target makes noise and attracts guards. But it may be less intuitive that shooting in the air can intimidate civilians, especially if a lot of other games that players have experience with do not implement that. I think genre also plays a role in this, and players may build mental models along the lines of their experience with the genre. Thus, the player is unlikely to treat the game independent of the larger gaming context it is part of, and previous games' mental models may influence future play experiences. I think what SOMA did especially well is establish early on, with the choice whether to unplug the talking robot, that the mental model that has been formed by the player from previous games does not carry over to SOMA, thus allowing the player to be in the right frame of mind for the rest of the game, and not treat choices similarly to how they would treat them in previous games they played. Fairly interesting information you put up. I don't really play games all that often but I read your blog when you make new posts. It's like musing on the philosophy of games. I'm stuck on wondering how you could find Portal the slightest bit non-linear. Ok, so I got nerved out when the rocket was shot at me and didn't finish the game, but up to that point the game was 100% linear. No choice. At all. Just doing what you were expected to do. I tried the entire way doing something other than the obvious, but nothing worked. Actually, that's something combat does better than puzzles - any game with multiple units / abilities lets you try to win in weird ways, while puzzles need their solutions specifically coded, and so usually just have one.